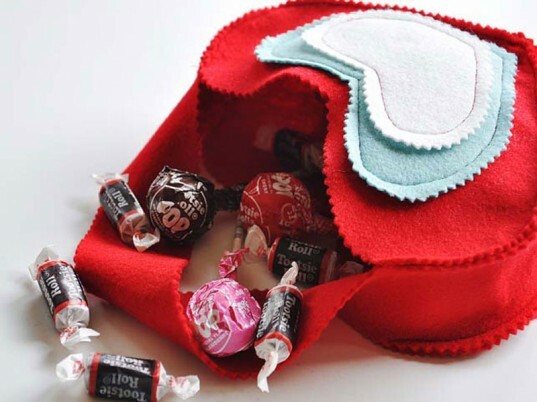 If you'd rather not spend money on Valentine's Day gifts and you'd like to go the DIY route, you can make sweet and crafty heartfelt goodies using eco-friendly supplies or by repurposing stuff you already have around the house. Besides which, the weather is cold, gloomy and snowy, so now is the perfect time to hunker down with your kids and get crafty. 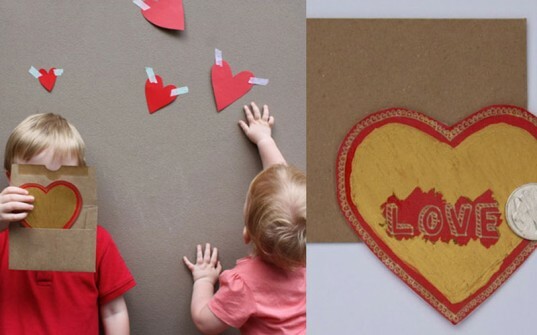 We found six eco-friendly Valentine's Day crafts you can do with your kids or for your kids from festive decorations to cards fit for passing around the classroom -- take your pick and spread the love! A string of cheery hearts will brighten your home and delight your kids. Graphic and textile designer Jessica Jones of How About Orange created this Valentine’s Day garland using stiffened fabric. Before you make these folded fabric hearts, look through your fabric stash or consider using old clothes, choosing festive colors of red, pink and lavender of course! What a sweet way to say “Will you be my Valentine!” These Heart Paper Pockets created by Makes and Takes founder Marie LeBaron for Craftzine are easy enough to make for a whole classroom of kids. 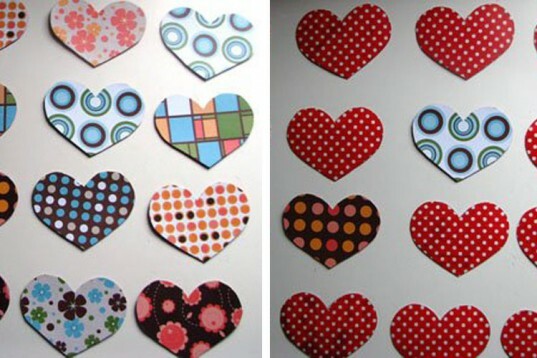 Look for appropriately colored scrap papers, old Valentines or magazine pages to make the paper hearts. Then you simply punch holes along the border and string yarn through the holes. When finished your child can put a sweet organic candy or a little love note inside. Scratch-off stuff is tons of fun for kids and these DIY Scratch Valentines make our hearts beat with excitement — these could be the biggest hit of your kid’s classroom! Little Lovely‘s Khali Whatley dreamed up this fun concept for Bloesem Kids. You can cut the hearts out from scrap paper or old cards you have lying around as long as there is a blank spot on them so you can write a message that will soon become secret. Next, you paint on a mixture of paint and dishwashing liquid to cover the words. Later, the Valentine recipient can use a coin to scratch and reveal any professions of love! From the crafty genius over at Scrumdilly-do!, this Heart-shaped Memory Game is fun to make and play with your kids this Valentine’s Day. Start by cutting hearts from a cereal box and then cover them with pretty scrap papers you have lying around the house or in the recycle bin. The best part is this game will live on long after V-Day! 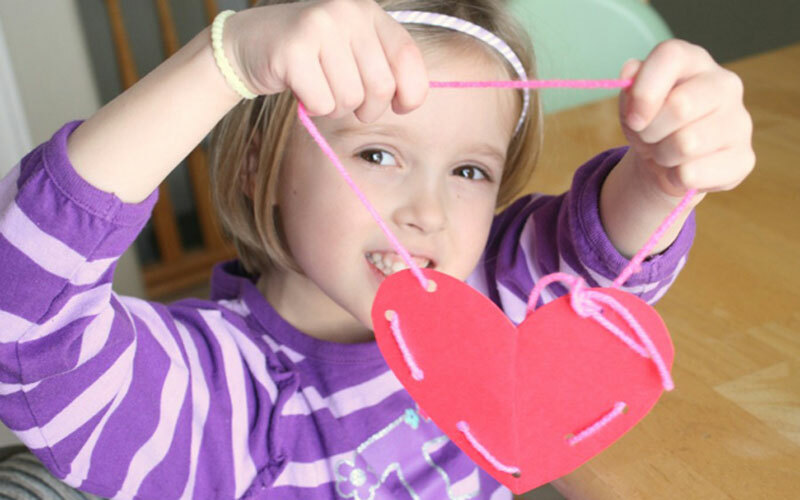 If your box of spare buttons is overflowing and you have an eager toddler or preschooler ready for fun, this Valentine Heart Craft from Pink and Green Mama is just the project for you. Cut a heart from a cardboard box and let your little one go to town painting or coloring it in a festive color or colors. Then give her free reign with your buttons and some eco-friendly glue. And there you have it: One of the easiest Valentine’s Day decorations around. If you love crafting sans kids too and can sew, here’s a project that you can make for your kids instead of with them. Susan Philips posted a tutorial for this handmade goodie bag on Momtastic. Create the bag using eco felt, stitch your child’s name or initial on the front, and fill it will sweet organic candy or homemade cookies. Fabric Valentine's Day Heart Garland A string of cheery hearts will brighten your home and delight your kids. Graphic and textile designer Jessica Jones of How About Orange created this Valentine's Day garland using stiffened fabric. 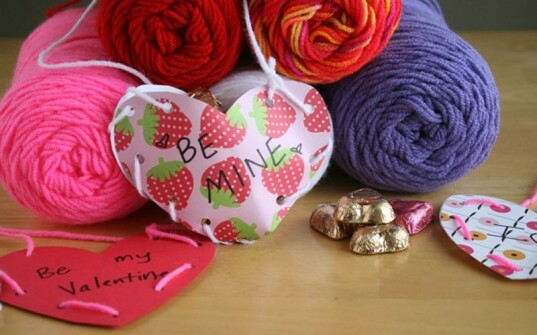 Before you make these folded fabric hearts, look through your fabric stash or consider using old clothes, choosing festive colors of red, pink and lavender of course! Heart Paper Pockets What a sweet way to say "Will you be my Valentine!" These Heart Paper Pockets created by Makes and Takes founder Marie LeBaron for Craftzine are easy enough to make for a whole classroom of kids. 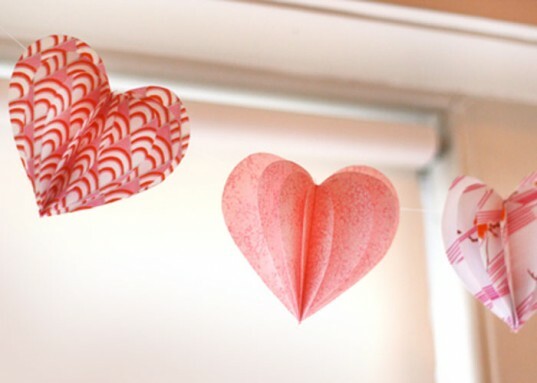 Look for appropriately colored scrap papers, old Valentines or magazine pages to make the paper hearts. Then you simply punch holes along the border and string yarn through the holes. When finished your child can put a sweet organic candy or a little love note inside. Scratch Valentine Cards Scratch-off stuff is tons of fun for kids and these DIY Scratch Valentines make our hearts beat with excitement -- these could be the biggest hit of your kid's classroom! Little Lovely's Khali Whatley dreamed up this fun concept for Bloesem Kids. You can cut the hearts out from scrap paper or old cards you have lying around as long as there is a blank spot on them so you can write a message that will soon become secret. Next, you paint on a mixture of paint and dishwashing liquid to cover the words. Later, the Valentine recipient can use a coin to scratch and reveal any professions of love! Heartfelt Memory Game From the crafty genius over at Scrumdilly-do!, this Heart-shaped Memory Game is fun to make and play with your kids this Valentine's Day. Start by cutting hearts from a cereal box and then cover them with pretty scrap papers you have lying around the house or in the recycle bin. The best part is this game will live on long after V-Day! 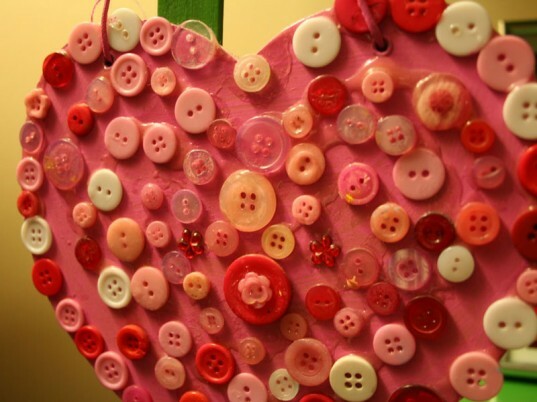 Button Heart Craft If your box of spare buttons is overflowing and you have an eager toddler or preschooler ready for fun, this Valentine Heart Craft from Pink and Green Mama is just the project for you. Cut a heart from a cardboard box and let your little one go to town painting or coloring it in a festive color or colors. Then give her free reign with your buttons and some eco-friendly glue. And there you have it: One of the easiest Valentine's Day decorations around. Heart Gift Bag If you love crafting sans kids too and can sew, here's a project that you can make for your kids instead of with them. Susan Philips posted a tutorial for this handmade goodie bag on Momtastic. Create the bag using eco felt, stitch your child's name or initial on the front, and fill it will sweet organic candy or homemade cookies.